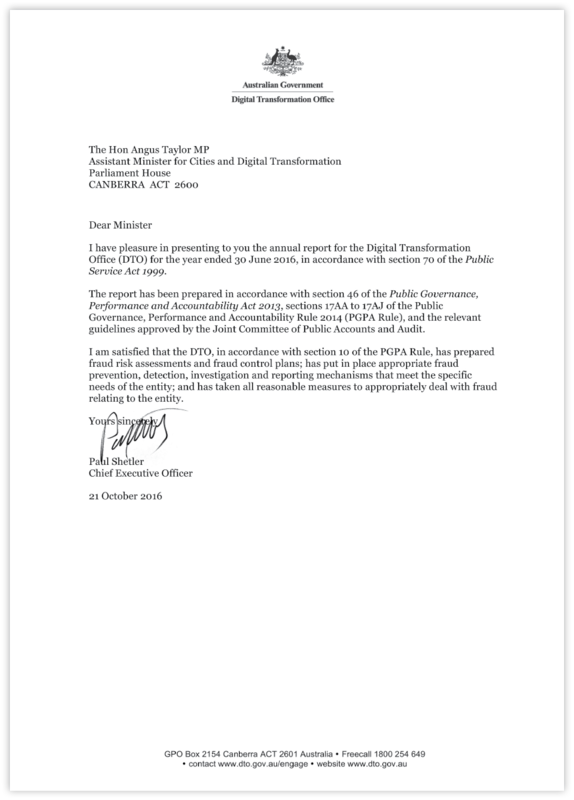 Cover and letter of transmittal for the DTO Annual Report 2015–16. View the PDF version (90 pages, 1.9MB) of the DTO Annual Report 2015–16. With the exception of the Commonwealth Coat of Arms, all material presented in this document is provided under a Creative Commons Attribution 3.0 Australia licence. The details of the relevant licence conditions are available on the Creative Commons website, as is the full legal code for the licence. This document must be attributed as the Digital Transformation Office Annual Report 2015–16. Read the full text version of the letter of transmittal.